The grave of Alfred Davidson, St Mary's Bottesford. 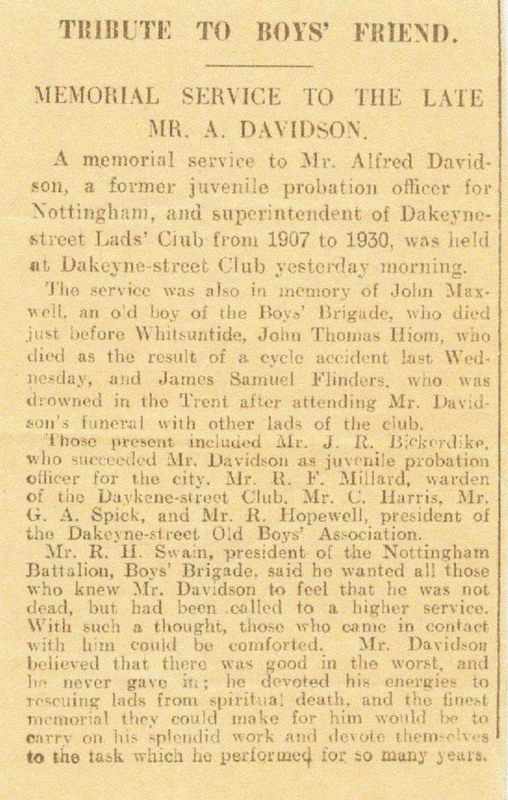 Press report of a Memorial Service for the late Mr Alfred Davidson. 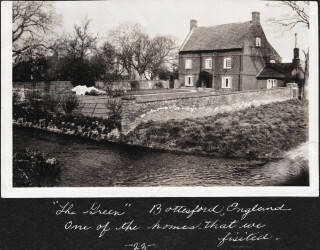 The Green, Bottesford, photographed in 1934 by Peggy Rhodes. Alferd Davidson at Dakyne Farm, Nova Scotia, 1913. Alice Kelly Davidson and descendents, 1954. 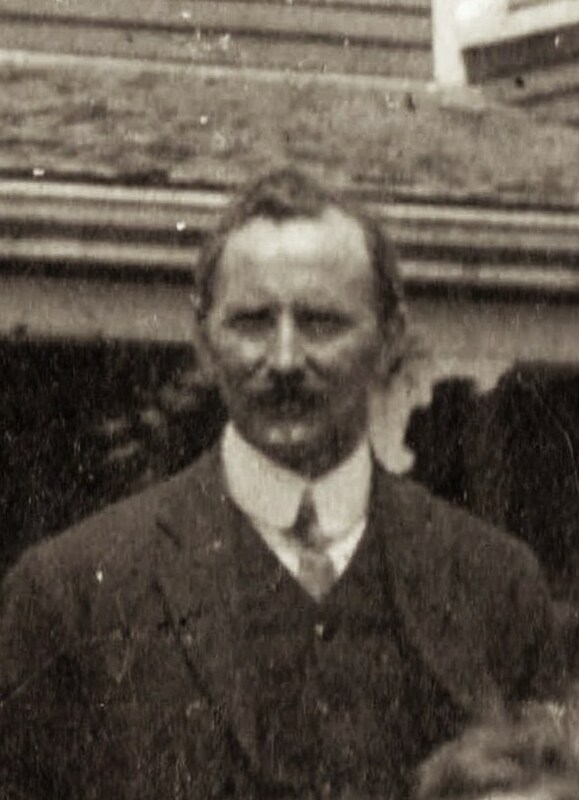 A photograph at the office of the 2nd Nottingham Company taken at the time of Mr. Oliver Hind's Wedding, in 1924. Front Row: Claude Whittaker; A. Davidson; O. W. Hind; George Guy; Glen Fisher. 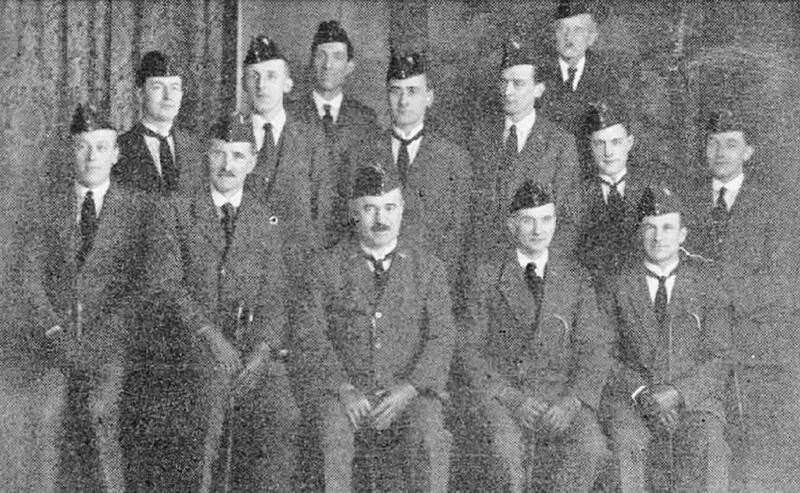 Second Row: Harry Green; Charles Sansom; William G ant; John C. Stokes; Harry Shaw; G. A. Spick. Back Row: Claude Harris; Albert Pounder. Recent communications from Anne Daly of The Green have come about after she and Dermot were contacted by Phil Rhodes of Mill Valley, California. 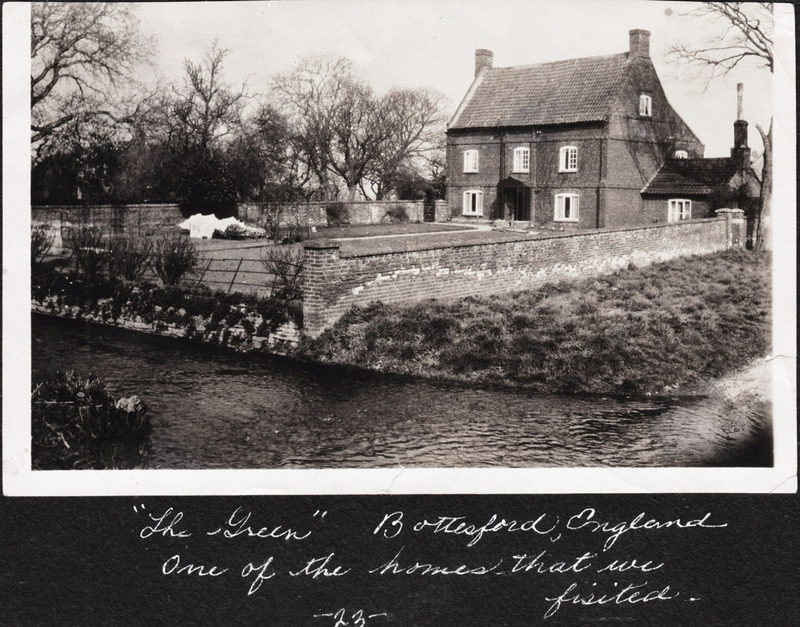 Phil had seen a photograph of The Green on this website which matched one taken by his aunt Peggy Rhodes when, a girl of 6, she visited Bottesford in 1934. Phil instantly recognized The Green and realised that this was the house where his great-great-uncle and aunt, Alfred and Alice Davidson, lived from 1930 to 1934 or later. 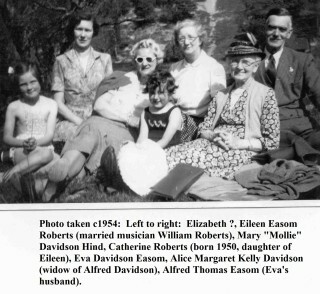 Alfred and Alice Davidson came to live in Bottesford in 1930. They apparently rented the smaller part of The Green, which had been partitioned into two dwellings some time earlier. 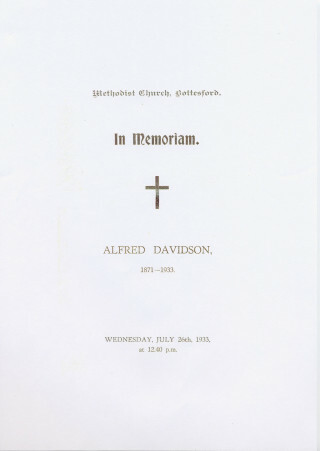 Alfred Davidson died in July 1933 and was buried in Bottesford graveyard at St Mary’s, although he was a Methodist and his funeral service was held at the Methodist Chapel in Bottesford. It is not immediately clear which of the two Methodist Chapels in Bottesford this was, but it seems most likely to have been the Wesleyan chapel in Chapel Street. 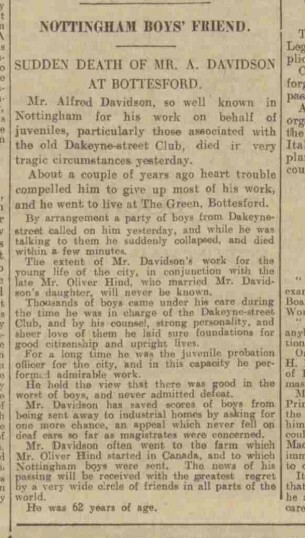 Mrs Alice Davidson was still living at The Green in 1934, but was not buried at Bottesford. She outlived Alfred by many years. 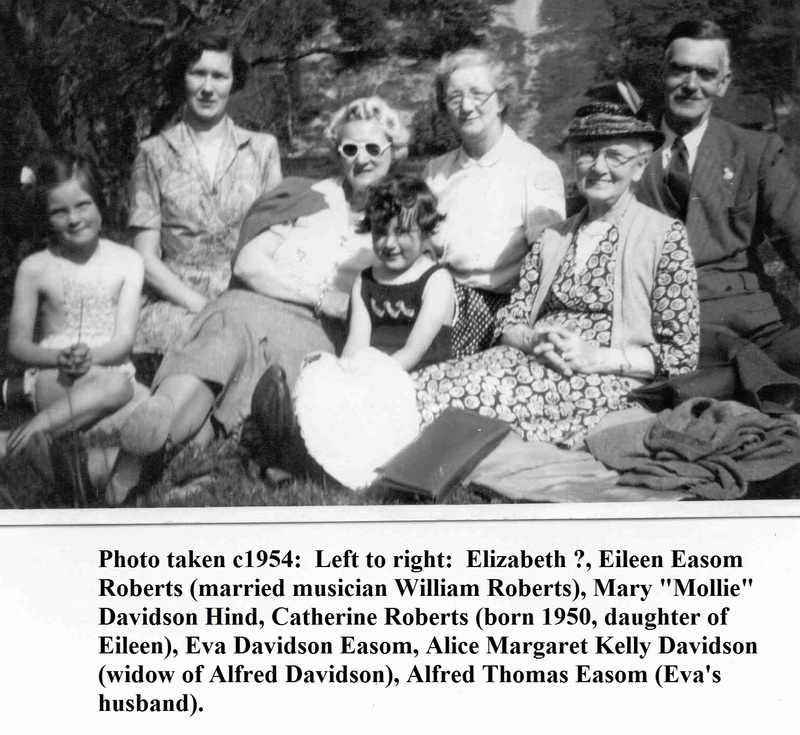 Phil Rhodes has been able to contribute only one photo of her, taken about 1954 on an outing with her family. It was scanned from the collection of a great-granddaughter; see the attached photo. Phil adds that he has not been able to determine where or when she died. Phil adds that the young lady on the left of this photograph is Elizabeth Kerrigan, elder sister of Angie Heckford (who kindly scanned this picture from her family collection). The Davidsons retired to Bottesford after living in Nottingham. 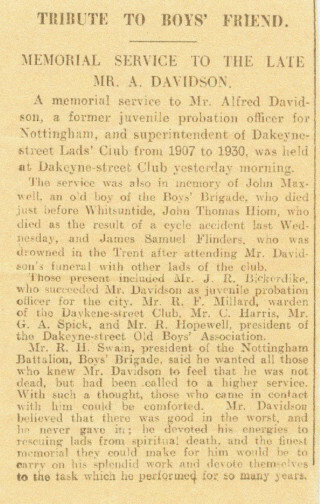 Alfred had been junior probation officer for Nottingham, but it is clear that his passion was for his voluntary work with the Boys Brigade for whom he had managing the Dakeyne Street Lads’ Club in Nottingham for many years until 1930. 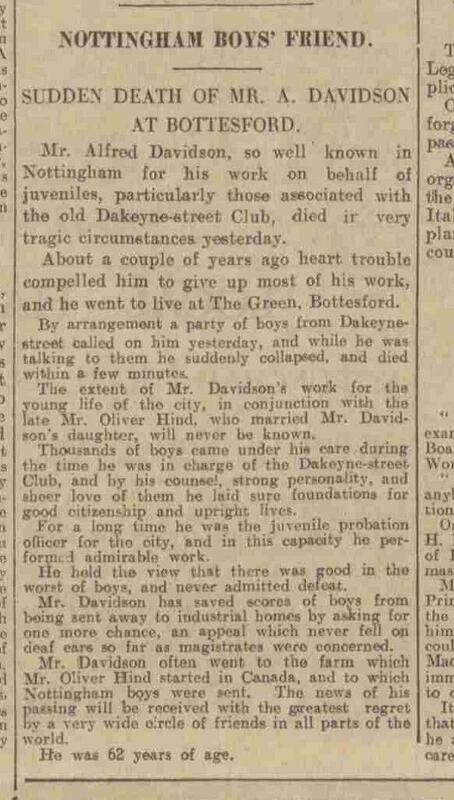 An articles in the Nottingham Evening Post, July 24th 1933, entitled “Nottingham Boy’s Friend – Sudden Death of Mr A. Davidson at Bottesford” told that he was 62 years old and had suffered from heart problems and that he had a sudden heart attack during a visit by a party of boys from the Dakeyne Street club (see press article illustrated below). Alfred Davidson’s grave is in St Mary’s graveyard, in the southern part within the shade of the old copper beech tree, which Phil tells us was already an old tree in 1934. 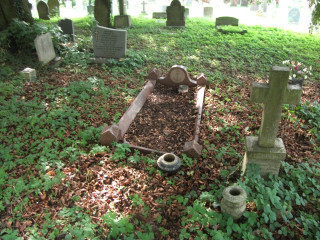 Alfred died on 23rd July 1933, and this date is recorded on the grave. 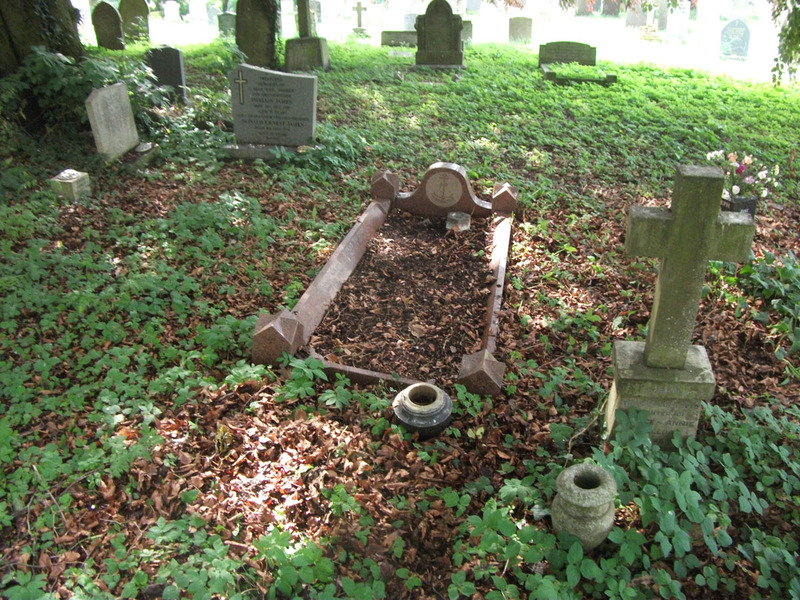 St Mary’s burial records tell us that he was buried on the 26th July 1933. The grave is within a rectangular frame of red granite enclosing an area of stones which cover the grave itself. 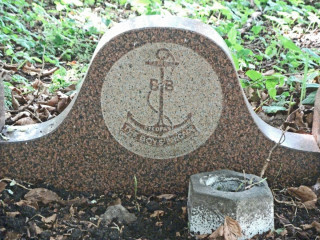 At the head of the grave is a round plaque which displays the symbol and motto of the Boys Brigade, to which Mr Davidson devoted much of this life in Nottingham. Below are two further press clippings that were contributed by Phil Rhodes. Finally, spare a thought for the tragic death of James Flinders, drowned in the Trent after attending Alfred Davidson’s funeral. 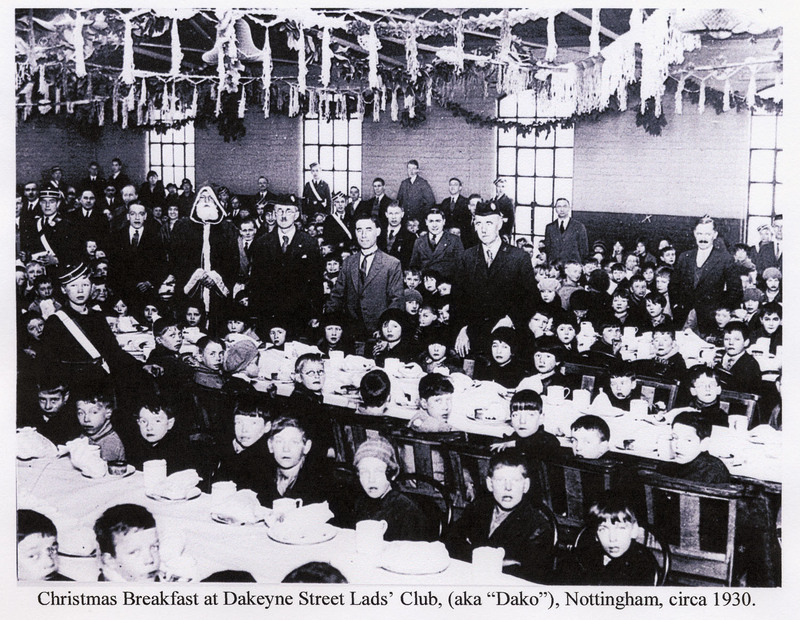 From The Thoroton Society Newsletter has a lovely short article, “The Dako Boys” by Rachel Farrand, published in 2010. 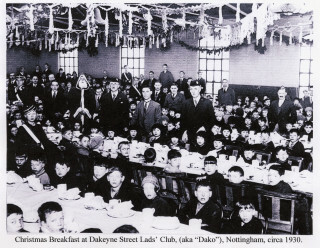 This article records the work the Dakeyne Street club did to help Nottingham boys to emigrate to Nova Scotia where a farm called Dakeyn Farm was opened in 1913 at Falmouth near Halifax. 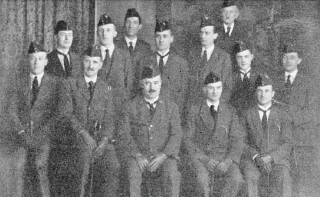 Many of these boys went on to serve with the Canadian army and some 70 of them lost their lives during the First World War. Finally, interested readers should get a copy of the recent book by Terrence Woolley, “Oliver Hind and the 2nd Nottingham Company of the Boys Brigade” – available from Nottingham Books. This page was added on 27/06/2013.